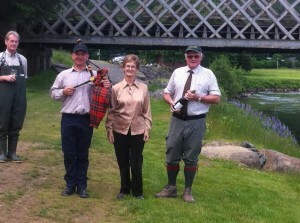 Alison & Donald Skene with Piper Jim! Owned by the Skene family since 2009, Dalguise is a regular retreat for both Donald and Alison. They take great delight in enjoying everything the beat has to offer by way of quality fishing and a stunning quintessentially Scottish environment. Most of all, they like nothing better than to see and meet new guests enjoying the easy wading waters Dalguise has to offer, seeing many grow from new guests to old friends, as deeply attached to the beat as they are. Donald and Alison have invested in a new, upgraded fishing lodge and better facilities so as to offer the very best in hospitality and comfort to not only anglers fishing the beat, but the friends and family who accompany them to spectate. They invite you to enjoy your day, mini-break or week of fishing – make yourself at home, unwind and enjoy a relaxing and cordial welcome from Donald, Alison, ghillie Moray MacFarlane and his wife Sam. Dalguise has a fascinating history prior to the Skene family ownership. 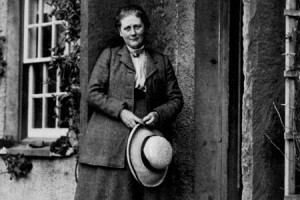 Most notably, the Fishings were owned by the Tempest family and for years were let on a seasonal basis during the Victorian era to the family of Beatrix Potter. 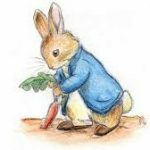 Spending so many of her formative years soaking in the varied flora, fauna and beauty of the Dalguise surroundings certainly inspired Beatrix – it is widely accepted that the ‘picture letters’ written by Beatrix while at Dalguise were the first drafts of her later books “The Tale of Peter Rabbit” and (so aptly!) 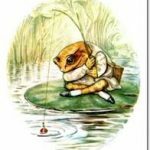 “The Tale of Jeremy Fisher”. This history fascinates many of our younger guests, and who knows what inspiration our junior visitors may find on the banks of Dalguise! The long history of hospitality, unforgettable fishing and enjoyment by all at Dalguise continues – we can’t wait to welcome you.